Recent advances in biological and computational technologies are changing the way we imagine race, gender, kinship, citizenship, and disease risk. Existing taxonomies may be displaced or reconfigured, impacting the ways in which people are governed, how lives are lived, how groups are known, and how power is exercised. 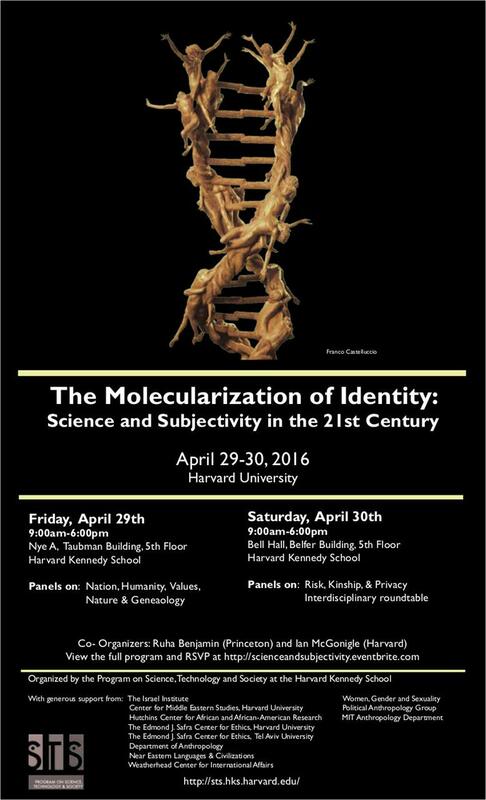 Drawing upon the tools and expertise from multiple disciplines and geographical regions, and with specific attention to the material and lived dimensions of these developments, this symposium interrogates the complex ways in which the molecular realm is an emerging site for constituting human identities in the 21st century. Organization/Sponsor: With generous support from: The Israel Institute; Harvard University’s Center for Middle Eastern Studies, Hutchins Center for African & African American Research, The Edmond J. Safra Center for Ethics, Department of Anthropology, Weatherhead Center for International Affairs, Women Gender and Sexuality, Political Anthropology Group, Near Eastern Languages and Civilizations; The Edmond J. Safra Center for Ethics at Tel Aviv University; and MIT Anthropology.